We are inside Sophie Sellu’s new studio, tucked inside an industrial estate in South East London. The clouds are thick in the sky as another lightless London day swings into action, but the small white space glows. A little orange candle flickers in the corner of the room as we run our hands over her newest creations; two ochre-coloured butter knives crafted from walnut. 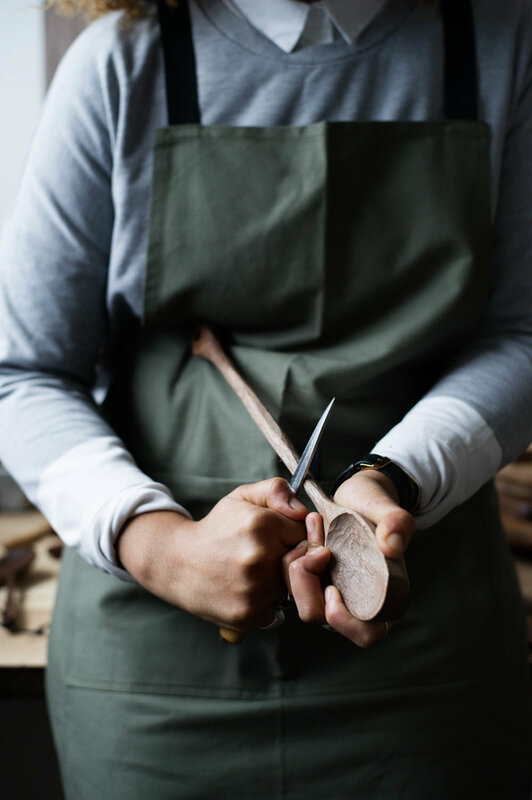 This is the Grain & Knot studio, where Sophie carves cooking utensils from reclaimed wood. She works alone in here most days, cutting away at a single piece while the coiled chippings collect at her feet. It was in the garage of her parent’s West London home that Sophie refined her skills, locking herself away every day to experiment with pieces of off-cut wood donated to her by friends and family. Like so many people before her, Sophie fell in love with the act of creating. Though, like the same people, it took her some time to contemplate making a living from it. “I always wanted to make stuff, and I always wanted to work for myself. I just didn’t know how.” Sophie remembers, “I never thought it was going to become a career. I thought it was just going to be a hobby. I didn’t leave the class thinking ‘This is my business.’ I wanted to keep doing it because it satisfied me and I enjoyed it. It was only when my friends and family started encouraging me to sell my pieces that I realised I had to take the leap.” And leap she did, launching her site soon afterwards. Since then, Grain & Knot has filled the pages of magazines, featured in the kitchens of some of the most celebrated chefs in England, and sold out online every week. Woodcarving requires three things: a pair of hands, sharp tools and time. This last ingredient is perhaps the most difficult. Each of Sophie’s unique pieces commands hours of her attention. Sipping strong coffee inside her studio, we watch her peel back curls of beech to form a large cooking spoon. We watch her candle the wood and skim through each chunk, revealing another portion of the finished piece. It is only then that we realise; we can’t remember the last time we saw someone making something entirely by hand. There is magic to ancient crafts existing in modern environments. As London blares on as one of the world’s most chaotic, progressive cities, some of its inhabitants are revisiting artistries of old. “Everything is becoming so flat.” Sophie tells us, “We are surrounded by screens and smooth surfaces. So the creative industries are building things that are tactile, and working with interesting textures. There’s something extraordinary in touching things that are organic, and making use of something that has a history.” “There’s been a shift.” She continues, “People are coming back to old techniques. They want to use things that have taken time to create, they like a story behind the things they use.” Sophie says all this with a half-made porridge spoon in her hand. These supple, robust spoons made from timber offcuts have become Grain & Knot’s signature product. “It was one of the first things I made.” Sophie explains, “I wanted to make something special. Everyone loves porridge, and I think it adds to the experience of eating.” We have two of these spoons at home. And it’s true, holding its buttery handle and bringing the smooth wood past your lips, steaming with porridge, has a certain charm to it. Stainless steel suddenly feels harsh and uninviting in its shadow. As rare as woodwork itself is nowadays, so is the notion of working alone without a team beating beside you. We wonder whether Sophie ever misses the company of an office. We attended one of her woodcarving workshops last month, and were struck my how internal the practice is. When handling a vicious scalpel and a flimsy piece of wood, your entire attention is required, and your thoughts lap over each other. “When you work on your own you spend a lot of time inside your own head.” She answers, “I can’t listen to music when I work. If I listen to something my head fills with thoughts. I always think back to when I was working in an office and just hating it. Now I can choose my time. I work when I feel inspired to, rather than forcing it at 9am every morning.” She looks out of the window again, the light bouncing off her wild curls, “I’m surrounded by people doing creative things here. There’s a set designer next door and a lighting designer opposite. Of course, it can get lonely sometimes. But when I see people’s response to the work it reminds me why I’m doing it.” We leave the warmth of Sophie’s studio and return home. I wander in to the kitchen and turn my Grain & Knot spoon over in my hands. I am suddenly curious about its past life. Perhaps it was once a step in a Victorian house. Perhaps it lined the edges of an art gallery. Maybe it was once a school floorboard, worn by generations. Whatever it used to be, it lives on now. It is an everyday pleasure to use. Flaws and all.